New Middle School Building Open! 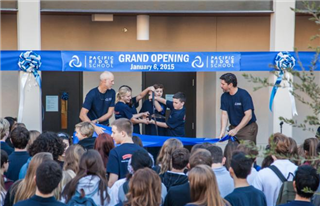 On Tuesday, January 6th, Pacific Ridge students returned from an extended holiday break to celebrate the opening of the new Middle School/Administration building. After a brief and joyful ribbon-cutting ceremony, students toured the beautiful new facility before heading to class. Middle School students especially enjoyed spending the day in the state-of-the-art classrooms they will now call home. Happy New Year!